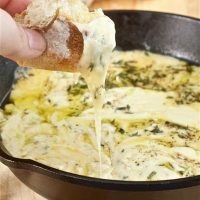 Baked fontina garlic cheese dip: THE BEST and most simple cheese dip for game day, parties, and holidays! Under 10 minutes and made in a cast iron pan! Brace yourselves for possibly the easiest appetizer you’ll ever come across! I’d say this recipe is even easier than putting together a cheese platter because there is no agonizing over what cheeses, meats, olives, crackers, etc. to buy. Wait a minute. Am I the only on who agonizes over things like this? 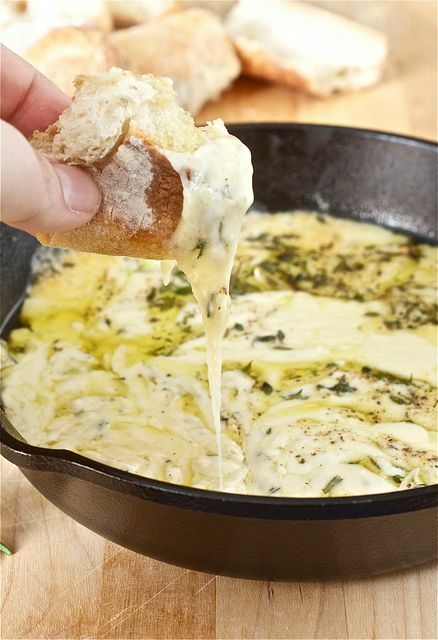 For this baked fontina garlic cheese dip, you’ll cube some Italian fontina, chop some garlic and herbs, throw everything for the cheese dip in a cast iron pan, add a drizzle of olive oil, and pop it under the broiler for 6 minutes. THAT’S IT!! 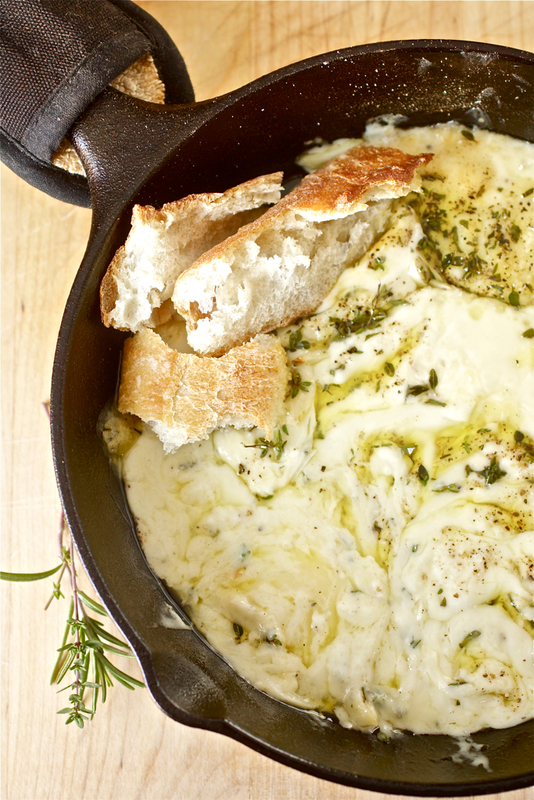 Seriously, it takes like 10 minutes to make this cheesy appetizer dip! The result is a baked fondue of garlicky, cheesy goodness that you can scoop up with hunks of bread, toasted sliced bread, crackers or wheat thins, or even sliced veggies for our gluten-free friends out there. The garlic and herbs permeate throughout the cheese when it bakes and every bite has a blast of herby flavor. It’s pure heaven…melted cheese heaven! 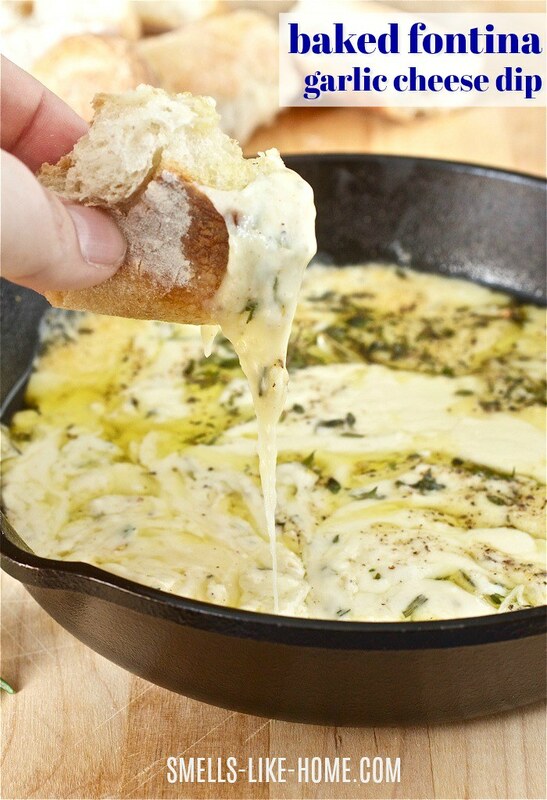 You Can Prep This Whole Garlic Cheese Dip in Advance! I made this baked fontina for a Christmas Day appetizer last year, have made it a couple times since, and I’ll be making it again for a Thanksgiving appetizer this year. Needless to say, it’s always a huge hit whenever I make it. Aside from holidays, I’ve made it for baby showers, summer bbqs, family weekend dinners, game day activities, and work parties (we have an oven in our office kitchen!). Whether you’re hosting turkey day and want to work this into your menu or you plan to bring this to someone’s house, cube the cheese and chop the garlic and herbs in advance and keep them in airtight containers until you’re ready to bake the dip off. Cheese Dip in Cast Iron – The Only Way to Go! Bring your cast iron pan with you to make this baked fontina – doesn’t everyone travel with kitchen equipment? – just in case your host doesn’t have one for you to use. Because a cheese dip in a cast iron pan is the best! The pan keeps the dip hot forevvvver. Since the recipe only needs 6 minutes under the broiler, you can even take the turkey out of the oven for a few minutes (cover it tightly with foil) and slip the pan in to bake. Hot appetizers really don’t get any easier than this one and I can already anticipate how quickly this baked fontina will go on the appetizer table this year. Click here for 70+ more Thanksgiving recipes on Smells Like Home! THE BEST and most simple cheese dip for game day, parties, and holidays! Under 10 minutes and made in a cast iron pan! Adjust top rack of the oven so that it sits about 5 inches under the broiler unit. Preheat broiler. Spread cheese out in the bottom of a 12-inch cast iron pan. Drizzle olive oil over the cheese. Mix together the garlic and herbs in a small bowl and sprinkle the mixture evenly over the cheese. Sprinkle salt and pepper over the top of the cheese. Broil for 6 minutes, until the cheese is bubbly and melted through. Carefully remove the pan from the oven and set it on a heatproof surface - the pan will be hot! Serve immediately. For this recipe, you're going to want to use Italian fontina, not Danish fontina that has a red rind. Italian fontina usually has a light gold rind or is packaged in a small block without a rind (like by Bel Giosio). Danish fontina won't melt the same as Italian fontina and your recipe won't turn out the same as is pictured here. This is one amazing recipe, I make baked brie ALL THE TIME and I’m Italian, what a grand idea this was! I made this awhile back and it is absolutely wonderful. You are so right describing it as melted cheese heaven! Oh my goodness….this looks ridiculously good. I love the simplicity with the melted herbs, garlic and olive oil. Of course it’s an Ina recipe. Might have to squeeze this in on Thanksgiving. I just had to wipe a pool of drool off of the keyboard. Totally making this for football this weekend! You’re right! How easy is this?! Love it. I love appetizers and could this one get any easier? Looks fantastic! Wow, this looks remarkable. I must make this, soon! Made this for an impromptu Thanksgiving party. They raved! It was ridiculous how easy it was. This is going in the cookbook. And I can’t stress enough, do NOT forget how hot the pan is! Is it weird that I just licked my monitor? I didn’t think so. dlyte2: No, but a cast iron pan will hold the heat really well when you take it out of the oven and will help to keep the cheese melted for a longer period of time. Cara: You could transfer the cheese to a bread bowl after baking/broiling it but the cheese won’t stay hot for too long – the cast iron retains heat really well and helps to keep the cheese hot. Alternatively, if you have a fondue pot with a low flame (or an electric one), that would work really well too. Let me know how you decide to serve it – this will help others who may not have cast iron pans. Hmmmm. I’m going to make this over the holidays using either my mini-crock or full-size crockpot! how long and what temp do you keep it in the crock-pot for? thats such a good idea! Is Brie the same as this cheese? I only have Walmart to shop and have never seen this cheese. It looks and sounds divine! Jennifer: Brie is not the same but since it melts so awesomely, I think it would still be great used in place of the fontina. It won’t be as stringy when it’s melted but I still think you’ll love it. Let me know how it goes! I think I’m gonna pass out. This is too good! Can this be done in a small Crockpot? I don’t have a cast iron pan, and I think the crockpot would keep it warmed up just like a cast iron pan. Looks delicious and I plan on making it for Christmas Eve! Nicole: I don’t know but you can try it! So simple and so addictively good! Is there another kind of cheese that can be used. We’ve checked our local Safeway and can’t seem to find Fontina cheese. I’d hate to substitute with anything substandard and feel like the recipe isn’t amazing! Jolene: Brie would work nicely here too. I made this tonight and it was FABULOUS!!! We only made 1/2 a recipe but my husband and I ate it all. We didn’t have any time so we used sage instead and it was delicious. @Jolene, our local grocery stores don’t have Fontina either so I stocked up when we went out of town on Saturday. KatieR: So glad you both loved it! Well, I have everything but the fresh thyme (gonna try it with fresh oregano). I also do not have a cast iron pan (it’s on my wishlist), so I’ll have to make it in a small’ish copper bottomed pan, I think it will be amazing (fingers crossed). Also, and seriously, this will be my last ‘also’, I’m making a half batch, because my kiddo said he would NOT eat this, it has too much green stuff in it. just saw this on pinterest – it looks absolutely mouthwatering and seems to be so easy to make! great stuff! I don’t have a cast iron pan, do you thing corningware or glass cookware/ anchor hocking would be ok to cook in? Danielle: As long as the dish is broiler-safe, it’s ok to use. Don’t use glass! 6 thinly sliced garlic cloves…it’s not to garlicy is it? 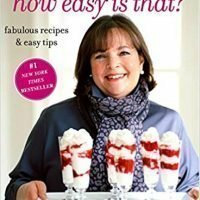 Keeley: Yes, that’s why the recipe is written with “Italian fontina” and not just “fontina” or “Danish fontina.” I hope it works out better for you next time! Can you use minced garlic and if so… how much? jbueno: You may risk it burning under the broiler but if you want to go that route, use as many cloves as the recipe states. If it’s preminced (jarred), check the jar for the conversion. Roughly how many people is this be good for? I’m Trying to judge if I’ll need to double the recipe. Can’t wait to try it!!!! OMG yummy! I can’t wait to make this. I can’t find Italian fontina – all I can find is Swedish fontina!! 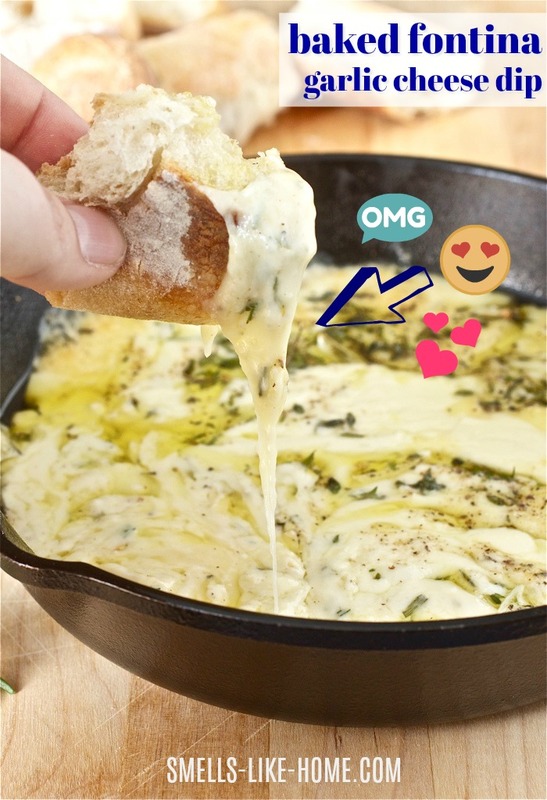 Kmugsy: I’m so excited that you took an extra step to find Italian Fontina – it really does make all the difference in this recipe (as you can tell by some of the other comments here). Great to know about the crockpot too! This sounds heavenly! Fontina is sooo good when melted. Cast iron skillets retain heat so well. I think I’m going to preheat the skillet a bit before adding the ingredients. That would keep the dip warm longer. About how people does this particular recipe serve? Ana: It really depends on how hungry they are – it’s difficult to judge appetites. If I had to guess though, for an appetizer, maybe 10-12. Don’t quote me though! This is AMAZING! Cozy comfort food and so easy to make! Thanks for sharing! it’s hard to find an italian fontina here in the philippines..what substitute will i use? thank you.. If you can find provolone, I think that would work well. I’m eating this right now…..sorry, had to take another bite, Umm to say its easy and delicious is an understatement! I made it in about 12 minutes and my family is ooo-ing and ahh-ing as I type. I have kids ages 11-2, they are gobbling it up!!! Mr. Hubs is in cheesy heaven! Definately a holiday appetizer or an anytime appetizer. Absolutely delectable!! This would be a great cob loaf dip. Just cut the topp off a cob loaf and scoop out the inside and chuck the mixed ingredients in, put it on a tray with the bread from the inside scattered around it and cook it in the oven. Mmmm! All I could find was Swedish Fontina, do you think that will work, and taste the same or close to Italian Fontina? You can try it but others have commented that Swedish/Danish fontina doesn’t melt well and it’s not known to have a great amount of flavor either, so I wouldn’t recommend it. See if you can hunt down some Italian fontina at another store. Whole Foods will definitely have it and I’m sure Trader Joe’s will as well. has anyone tried this with gouda? it melts in a stringy way. I couldn’t remember what kind of cheese the recipe called for when I was at Trader Joe’s so I guess I’ll give it a whirl with the gouda. this is bomb. simply bomb. the most amazing homemade appetizer. Thank you so much for this recipe! I saw it on pinterest and made it for Thanksgiving and it was a HUGE hit. I made it exactly according to the recipe and it was perfect. THANK YOU!!! It’s always a huge hit with my family too – glad you all loved it!! How much bread do you usually serve this with for an appetizer? One loaf of French or ciabatta bread should do it. Just slice it really thin. I’m wondering would a mozzarella work? Eh. Mozzarella would work but the Italian fontina has so much more flavor than mozzarella. It will be also be suuuper stringy so be prepared. Thanks for the QUICK reply!!! The recipe sounds delicious ~I can’t wait to try it! I just saw this on Pinterest. Love this easy recipe, and I’m going to repin it, and then check out more of your blog! If I use brie do I need to cut the rind (or whatever that outer stuff on it is) off? Where can you find fontina? I have looked at Walmart, piggly wiggly & Winn Dixie without any luck! My regular grocery store has it but I’ve seen it BJs (I’m sure Costco would have it too). I don’t know what stores you have where you live so it’s hard for me to respond. If you can’t find Italian fontina, try brie (without the rind). Our Costco doesn’t have the Italian Fontina. Kennewick, WA. Will try the Brie. Thanks. I made this for our family at Christmas and let me tell you…SUPERB! And you’re right – the cast iron pan is really a must. Although since this was devoured by 5 men in about 12 seconds, it didn’t have a chance to cool down! Thanks for posting this. Found it on Pinterest. Can’t wait to try this! My hubby would LOVE it! I saw this on pinterest, this looks amazing! I was just wondering about how long will this stay nice and melty for? – Though I’m sure it will be gone before that happens! It stays melty for about 15-20 minutes but it can easily be reheated under the broiler. I just made this and it’s truly delicious. The fresh herbs make all the difference and the aroma is beyond intoxicating. I had one problem. The cheese melted beautifully and was relatively creamy when I first took it out of the oven but not nearly as creamy looking as your photos. It seemed to harden up very quickly once it started to cool off. I didn’t read the comments before I went shopping and I noticed that you recommend Italian Fontina. I just checked and the one I used was French. I’ll try to find the Italian cheese next time. Still, it had a wonderful flavor and I will definitely make it again. This recipe does not have any YIAH Herb and Garlic dip mix in it like it is advertising on pinterest. Was it left out on accident? Found the Italian fontina at Sprouts (grocery store) and the herbs were from my garden. We absolutely loved this dish! So simple and delicious! Yay! I know – SO simple, right?! This looks amazing! Do you think if I baked it first I could microwave it back to melty goodness? I have a work party I’d like to bring it to. Sure – that should work fine. I can not find this cheese in our stores here in Alabama. Is their a substitute? I’m sure brie would be amazing here instead of the fontina. I know you might loose a little smokiness, but I’m wondering if this could be done in a small crock pot for traveling as well? Sure – I don’t see why not! I just saw this on Pintrest and was wondering… If I cooked it in the oven on broil for the 6 minutes, could I just transfer it into a crock,pot to keep it warm? My one daughter would love this at her Graduation Open House the first of June. Don’t you think that would work? Thanks for any help or opinion you could give. I don’t really know since I’ve never used a crockpot for this recipe. I’d say give it a trial run and see how it turns out. This. This is amazing. The herbs and garlic are to die for. And what did I do before I owned a cast iron pan? I will now have a cheese conundrum on holidays, deciding between this and my go-to Baked Brie and Onion Puff!! 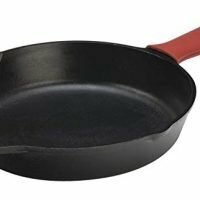 I know – isn’t cast iron the most versatile and amazing pan ever?? We are fortunate enough to have a woodstove. As directed, I used our cast iron skillet and after I made this DELICIOUS recipe, and then I put the cast iron skillet on top of our woodstove. The fire had dwindled down and it kept the cheese soft for a bit longer. Great recipe! It will be prepared in this house many times in the future. Question: I don’t have a broiler, just a toaster oven that we’ve been using to cook everything in (newly wed). If i set it on the highest temperature, will this recipe still work for me?? It should definitely work and if there is a “broil” setting, use that. Otherwise, bake it first then turn on the toast setting – that should do the trick of really getting the top melted. Be sure to let me know how this turns out for you – it could be a great alternative cooking method for lots of people! I have made this recipe several times for my Bunko group. They LOVE it!! It is so easy and really yummy! Thanks for sharing! should the garlic be roasted or raw? Raw garlic, though roasted garlic (if you have it already made) might be really good too! This is totally awesome, have made it to share with friends & family, my boys 1st year adoption anniversary dinner, always, always a HIT! I have a convection oven without a broiler. Will it still work? Would I need to adjust the cooking time? I’ve made this….it’s a MUST try….It’s delicious and easy to make. If you don’t have a cast iron pan, a Corelle dish works just fine. Good to know about the Corelle dish working well! Nikki, Any type of oven proof casserole dish will work in place of a cast iron pan. Make sure it is big enough so the cheese dip will cook in the amount of time the recipe calls for. Has anyone tried adding spinach to this recipe? You believe using Brie would be better than the Danish fontina? Have you made it with Brie before? May I ask what kind of bread is pictured? I’m pretty sure it is just a loaf of French bread. Any kind of crusty bread or even hefty crackers like wheat thins or triscuits would work as well. Hope you like it! this looks like heaven and so easy to make!! Any cheese substitutions that won’t make me spend $10 on cheese? It depends on what kind of cheese you like. Other commenters have suggested that brie is a great substitute. Made this and everyone loved it,next time I am going to put my cast iron over a sterno to keep the cheese melted !! It’s not recommended to use Danish fontina for this dish so I have not made it without Italian fontina. I’m sorry I don’t have any suggestions for you. It takes a whole lot of willpower not to devour this whole pan by yourself. 🙂 Hope you love it! Let me know how it turns out for you. So I was agonizing about what to bring to my family’s house for Christmas Eve dinner since I have to work during the day and won’t have much time… and then I spotted this gem. Totally doable at the last minute! Woohoo! 30 Uber Cheesy Cheese Dips!